Flying from sea to shining sea is the ultimate cross-country adventure for any pilot, especially for this novice. Departing from Gaithersburg, Md. (KGAI), early in the morning with mother as my copilot, we headed for the Pacific in my two-seater SportCruiser light-sport aircraft (LSA). We planned to follow historic Route 66 and land at all of the landmarks on the way. After months of planning, I was ready for adventure…and boy, did we find it! We had a blast visiting the main tourist sites as we traveled along, including the St. Louis Arch, Grand Canyon, Las Vegas, Sporty's and more. However, our favorite stops were the old, World War II-era airports that appear sporadically along Route 66. Shamrock Municipal Airport (2F1) in Shamrock, Texas, was my personal favorite, with a dirt road that leads to the runway. The approach/departure path is directly perpendicular to old Route 66. The owner of the Route 66 Inn was more than happy to pick us up in the family car, as long as his son could sit in the airplane. Shamrock's art deco-era U-Drop Inn was used to model the famous Route 66 gas station in the Disney movie Cars and was a great attraction. The Western states also offer several unique airfields you won't find anywhere else. From above, Kingman Airport (KIGM) appeared to be a busy international airport with hundreds of commercial planes. Upon landing at the large non-towered field, I realized the airport is now used by the major airlines to store unused planes, many of which have their engines removed. Kingman is a great stop to get up close with the legacy of commercial aircraft. Another field worth visiting is Needles (KEED), a former World War II army base in Eastern California. Located in the California desert, we camped next to the SportCruiser and spent an afternoon photographing the numerous historic planes scattered around the airport, now used for parts. I learned quickly that while prior planning is critical, no amount of studying will completely prepare a pilot for a journey. I'm no expert pilot; in fact, I earned my sport-pilot certificate less than a year ago and passed the 100-hour benchmark on this trip. I embarked on this journey with the goal of demonstrating to myself (and the general aviation community) that the dream of purchasing an LSA, earning a pilot's certificate and flying coast to coast isn't only still attainable, but completely enjoyable! Beginning my pilot training in 2014, I was attracted to the LSA category for several reasons. I liked the streamlined certificate process: 20 flight-hour minimum with no medical exam, the relatively low hourly costs (roughly $25/hour), and the modern avionics and safety equipment. One apparent drawback to the LSA category was the general misconception that LSA aren't practical cross-country, long-distance aircraft. I wanted to evaluate this for myself. The coast-to-coast planning process began with pencil and paper on a large VFR chart of the United States and involved several meetings with my CFI. I decided to fly west from Maryland, pick up historic Route 66 in St. Louis, Mo., and follow the "Mother Road" all the way to the Pacific to Santa Monica Municipal Airport (KSMO). Aside from the obvious sightseeing benefits of following America's most famous highway, I learned that following major roadways has many advantages for long VFR flights. The roadway provides a valuable ground reference, especially in poor weather and with changing terrain. Moreover, in the event of trouble, airports, open fields and cell phone coverage tend to cluster along major highways. As a novice pilot in new territory, this was helpful and reassuring. Make sure to stay to the right side of the roadway to avoid encountering other VFR traffic that decided to follow the same road head-on. Double Eagle Airport (KAEG) in Albuquerque, N.M., with the Sandia Mountains in the distance. A "gear-up" landing occurred minutes after we tied down, closing the active runway and reiterating the potential consequences of pilot fatigue. After charting the trip on paper and electronically on my iPad, my local CFI suggested contacting an additional CFI more familiar with the West Coast to review specific routes and procedures. This proved valuable as the local CFI provided several tips and suggestions that couldn't be gleaned from studying a VFR chart. We reviewed every leg of the journey, with special focus on congested airspace like the Grand Canyon and the Los Angeles terminal area. After careful planning, we were ready to start our journey. I filled the baggage area and wing lockers with a suitcase, tent, sleeping bags, survival gear and as much fuel as possible before reaching the LSA maximum weight of 1,320 pounds. Flying exclusively on the East Coast, calculating the SportCruiser's weight and balance and the airport's density altitude was an exercise I practiced primarily to pass the FAA checkride. These calculations simply weren't critical for most flights near sea level in the two-person SportCruiser. I read several accident reports detailing overweight, low-wing aircraft that were able to lift off the runway with the assistance of ground effect just to fall behind the power curve and settle back to the ground beyond the end of the runway. This typically results in a forced, off-airport landing with tragic results. Using a hand-held luggage scale and weighing all items, I performed weight, balance and fuel calculations at each stop. I was very aware of these limitations, yet I still had two instances where weight and balance were critical. The FAA doesn't issue airworthiness directives (ADs) on LSA. If there's a maintenance issue, the manufacturer will issue a service bulletin outlining inspections or maintenance that may be required. Both of these incidents occurred well below the 10,000-foot MSL altitude limitation for LSA and without full fuel tanks. The first incident occurred while departing Gallup Municipal Airport (KGUP) in gusty wind conditions, elevation 6,472 feet MSL. Just after liftoff and out of ground effect, the wind quickly shifted from a quartering headwind to a quartering tailwind at about 15 knots. The throttle was pegged at 100% and the artificial horizon was indicating a positive flight attitude, but I was quickly losing altitude and settling toward the treetops below. I was below 250 feet AGL, and my only option to avoid stalling the plane was to nose down toward the trees. With a very tight grip on the stick, I kept the plane above stall speed and eventually headed back in the direction of the shifting wind. After a few scary minutes of low flight, we finally reached a safe altitude. My lesson learned: pay close attention to shifting winds, keep the airplane as light as practical and practice flying at gross weight during slow flight. Memorize your critical air speeds and focus on maintaining them—it just might save your life. A second near-miss occurred at a towered airport, midday, in the Arizona desert. The high heat conditions resulted in a deceptive high-density altitude, even though the airport was below 3,000 MSL. Density altitude can be significantly higher than true altitude and will fluctuate throughout the day as temperature, pressure and humidity change. So it's good to always check again right before departure—something I always did—to make sure that the airplane was in the appropriate weight-and-balance performance envelope. The tower cleared us for departure, and after liftoff, ATC vectored us over a local mountain range to avoid inbound traffic. After changing course and establishing a positive rate of climb, it became apparent that we wouldn't be able to clear the fast-approaching mountain range. I immediately radioed the tower (yes, I was nervous!) that we'd be unable to clear the mountains. The tower cleared us for climbing turn over the airport to gain altitude. I was grateful (and relieved! ), and immediately complied without incident. Route 66 proved to be a valuable ground reference, especially in sparsely populated areas or marginal weather. In the event of trouble, airports, open fields and good cell-phone reception typically accompanied the highway. 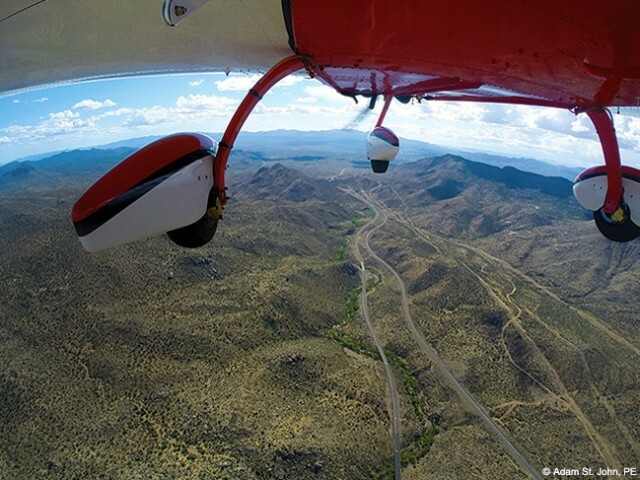 For cross-country VFR flight, especially in congested airspace, use flight following and approach whenever available. These services truly make flying easier and safer. Like most novice pilots, I was initially intimidated to contact ATC and worried I'd be distracted from piloting, especially in unfamiliar airspace. I quickly found that contacting ATC approach to obtain flight following instead of relying solely on VFR made flying much easier! Knowing that ATC could track me and other traffic in the area allowed me to focus on safely piloting the aircraft through the complex airspace. Take the time to study ATC communication procedures: Practice speaking before you key the radio and know beforehand what information they'll require from you (aircraft type, destination, altitude, etc.). If you're a competent pilot with good basic radio skills, you won't regret the decision to do so. We arrived in North Texas during the severe flooding and tornadoes that occurred in the spring. After spending almost two hours avoiding severe weather around Dallas Class-B airspace, frustrated and tired, I contacted Dallas Approach and requested vectors through their airspace and around the weather. Approach immediately honored this request, cutting the trip by more than 50 miles, and they monitored the nearby severe weather in real time. I was ready to hug the controller through the radio after we finally touched down safely! Be sure to review all navigation tools in the cockpit and stay current on all of them. While departing a towered airport underneath the Las Vegas Class B airspace, my iPad overheated during departure and completely shut down. Thankfully, I had the paper Las Vegas terminal chart on hand, and we avoided the controlled airspace (and the arriving 737) above us. As we approached Hoover Dam, I realized quickly that even after careful planning and CFI consultation, there were still certain uncontrolled areas along the route that were too busy for a novice pilot like myself. My CFI taught me to know my limits and know when to turn around. After approaching the Hoover Dam and listening to CTAF for that area, I decided it was best to depart the area. With the combination of fast-moving VFR commercial sightseeing traffic and being unfamiliar with the local landmarks referenced on the CTAF frequency, I decided to avoid the area completely. Even though I could legally fly in this area, it wasn't worth the risk. Adam St. John and his mom show their start (Gaithersburg, Md.) and finish points (Santa Monica, Calif.). As mom and I progressed westward along Route 66, I quickly realized how much I had underestimated a critical aspect of flying cross-country: pilot fatigue. As a young, energetic pilot, I planned on flying an average of at least six hours per day. I decided to fly with two different passengers, switching passengers in California. Unfortunately, both passengers had zero pilot experience. After four consecutive long days of flying, it became apparent that flying more than three consecutive hours as the sole pilot in charge (even in perfect weather) compromises a pilot's ability to focus and remain alert. (It certainly compromised this pilot's abilities!) More importantly for me, the more I pushed the limits of fatigue, the less I enjoyed the trip. If you plan to fly more than four hours a day for multiple days, fly with someone who's competent and willing to take the stick. It will make the trip much safer and more enjoyable for both of you. As a novice pilot in new territory, I planned each stop carefully, especially during challenging mountain flying. A problem arose when I arrived, low on fuel, at the only airport with working fuel pumps for 150 miles. The airport was in the Rocky Mountains, and the crosswind component fluctuated between 15 to 21 knots, in excess of the published 12-knot maximum in my Pilot Operating Handbook (POH). I was aware this was beyond the published limits of the plane, but I had no other landing options. I lined up for a final landing approach, and, after two hair-raising aborted landings, I managed to land successfully. Next time, I won't be apprehensive to practice maximum crosswind landings back home. Another lesson for piston aircraft pilots is to ensure that your arrival airport has your specific type of fuel. After landing low on fuel at a field in Texas, I found that while the chart indicated that the airport did in fact sell fuel, they only offered Jet A. Fortunately, the 100 hp Rotax engine in the SportCruiser accepts both auto fuel and 100LL aviation fuel. After a trip to the local gas station and five gallons of 93 octane, we were off again. The pilot experience gained on this trip was invaluable and wasn't limited to just time in the air. Talking—and mostly listening—to pilots in local FBOs proved valuable. Periodically grounded due to weather, we camped at the tiedown or unrolled sleeping bags in the pilot's lounge for the night. Local pilots regularly offered food, personal transportation and plenty of advice at each pit stop. The GA hospitality from far more experienced pilots was a welcome surprise, and I truly appreciated every minute of it. I returned from this 15-day coast-to-coast trip a far more experienced, better pilot. With the proper planning, I found this VFR trip to be safe, enjoyable and affordable (especially in an LSA!). • Operate as pilot in command of a sport-pilot eligible aircraft. • Carry a passenger and share expenses (fuel, oil, airport expenses, and aircraft rental). • Fly during the daytime using visual flight rules (VFR). Three statute miles visibility and visual contact with the ground are required. • Cross-country flying anywhere in the U.S.
• Fly up to 10,000 feet above mean sea level (MSL). • Fly solo or with one passenger. • Fly in Class E and G airspace (and B, C, and D airspace with appropriate training). • Allows sport pilots to fly production (standard airworthiness certificate) and experimental amateur-built aircraft that meet the definition of a light-sport aircraft. • Allows rental of special light-sport aircraft (S-LSA). • Prohibited from Class A airspace. 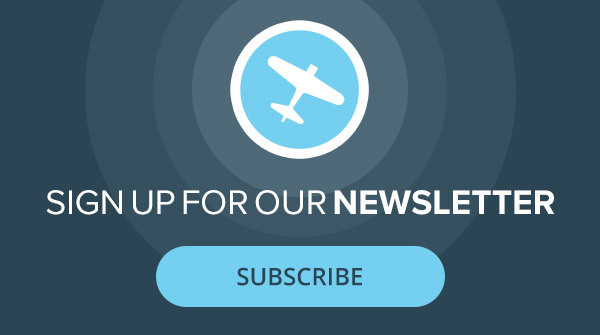 • Prohibited from flying in Class B, C, or D airspace until you receive training and a logbook endorsement from an instructor. • May not tow any object. • No flights while carrying a passenger or property for compensation, or hire. • Prohibited from flying in furtherance of a business. — LSA pilots can fly up to altitudes below 10,000 feet or 2000 feet above the ground which ever is higher. –In a high-altitude area like the Southwest and West, this is an important distinction. Thanks very much for this terrific article. I hope you make more photos (video?) available. Great article Adam, your a very gifted writer and flying enthusiast. I would like to read more of your adventures. I’m reading this in FEB 2018 and wonder how the Rotax is holding up for you? Have you had any serious or unexpected expenses due to engine mechanical issues?